Kirk's Enterprise NCC-1701 from the original Star Trek TV series! Classic replica vehicle from the Starship Legends line. Shatner's voice, plus other lights and sounds. This baby is not to be missed! Brush up on your Captain Kirk impressions. The USS Enterprise NCC-1701 is instantly recognized as the ultimate symbol of the Star Trek franchise. 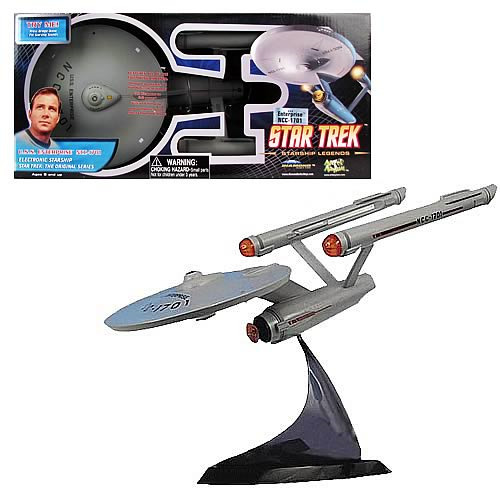 Continuing the line of Starship Legends, this classic, 16-inch replica features realistic light and sound effects from the original series, and the voice of William Shatner as Captain James T. Kirk! This puppy is not to be missed! "Prepare to attack. All hands, battle stations!" "All weapons to full power."